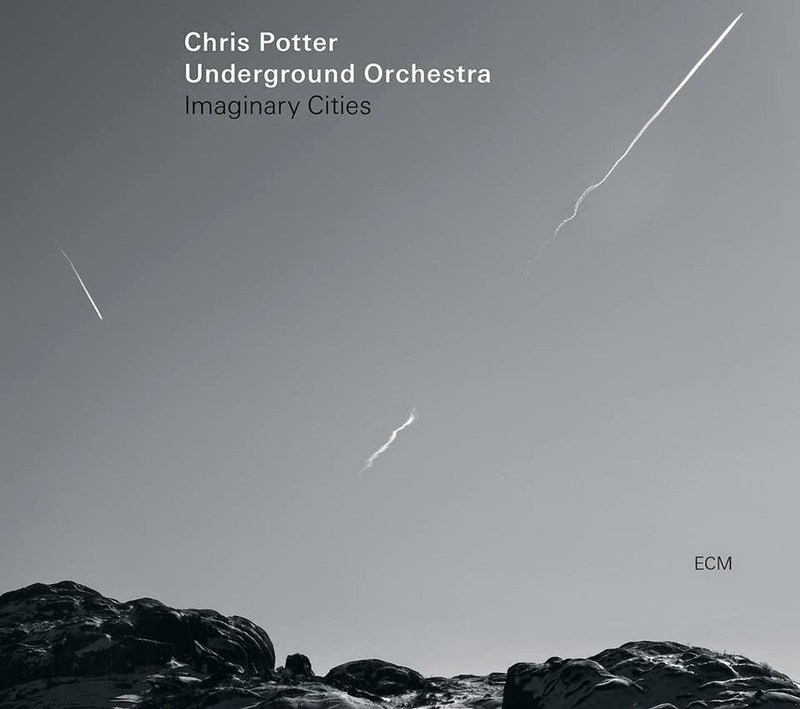 Chris Potter didn't set out to do a concept album about the state of the urban landscape. But in some ways the music on Imaginary Cities does come off like a musical assessment of it. Any given piece of real estate, be it rural or urban, comes with many layers to it, geologically and historically speaking. The suburban sprawl that we see while driving, crammed to the gills with billboards, fast food establishments and the occasional Mom and Pop store - what did it look like half a century ago? Inner city communities still have buildings that was constructed in a period prior, with storefronts commingling with houses, in various states of repair, still echoing a time when neighborhoods were self-sufficient and there was no need to hop on a bus or get in a car to go and do your shopping. Where does it go from here? Was it better back then, or is it better to keep move forward? Maybe it's neither of the above, and better to just stare out at the vast sky and soak in the scope of it. These visuals spring to mind on the tenor saxophonist's new album, which takes his Underground quartet (pianist Craig Taborn, guitarist Adam Rogers, drummer Nate Smith) and adds two bassists (upright player Scott Colley and bass guitarist Fima Ephron), a string quartet and vibraphonist/marimbaist Steve Nelson to it. They create a rich sound, especially during the different sections of the four-part "Imaginary Cities" suite, "Compassion," "Dualities," "Disintegration" and "Rebuilding." The names, when taken together with the music, conjure up images of various aspects of city life. "Dualities" seems to depict the contrast between the minor strings and the bright sounding marimba. "Distintegration" is especially telling, where Potter's soprano and the strings move rather freely over a mix of acoustic guitar and basses, creating some eerie tension. Some of it sounds completely composed, while other sections give everyone space to move freely. Finally, to read more into the whole concept, Potter aptly ends by proposing solutions, not merely bringing up issues. "Rebulding" begins with Smith laying down a odd-time groove that Potter (back on tenor) and Nelson use to great advantage. The 11-minute piece goes through various shapes, holding down the groove before switching in the final quarter into a more midtempo section. But that's only half of the album. "Lament," which precedes the title suite, features Potter's tenor playing over a yearning two-chord vamp towards the end which still has plenty of fire brewing, the strings giving the music a more expansive sound, never acting as a sweetener. The quartet gets as much frontline room as Potter on "Shadow Self," which is inspired by Bela Bartok. The closing "Sky" acts something like a final statement to the whole city concept of the album. The music is vast and expansive, as if trying to encompass the surroundings, again bolstered by the arrangement of 11-piece group. Strings and jazz can make strange bedfellows. Even the way the strings are recorded can impact the impact of the music. Potter uses them in his music to alternately create tension and reinforce the beauty of his music. In doing so, new things are discovered with each listen, from the shape of melodies to subtle colors that Craig Taborn uses to add drama. It's a work that gets more meaningful with time. One of the most dramatic scenes in It's a Wonderful Life comes in the part where George Bailey has no identity and he sees his widowed mother running a boarding house. Frank Capra really plays up the pathos, filming half of Jimmy Stewart's shocked face at close view. Behind him, Clarence the angel says, "Strange, isn't it? Each man's life touches so many other lives. When he isn't around, he leaves an awful hole, doesn't he?" I thought about Clarence's observation when I heard that Bernard Stollman, the eccentric found of ESP-Disk records passed away yesterday at the age of 85. He lost a battle with colon cancer that had spread to his spine. ESP was the first American label to give Albert Ayler due recognition. Even though Broadside initially issued the Fugs' debut album, ESP later reissued it and brought it to more people, and released their self-titled second album (which is arguably their best one). Pearls Before Swine. The Godz. Paul Bley. Patty Waters. The list goes on and on. And on. And it includes albums that maybe should not have been released. But they were. The world is a little stranger for it, in a good way. Who knows how many outsider artists were motivated to make music based on what they heard on that label? It all comes back to Stollman's eccentric vision. He started the label because of his commitment to promoting the Esperanto language. (That's what the label's name represented.) The first album was Ni Kantu en Esperanto, an album of insipid traditional songs sung in Esperanto. I once talked to an ESP act and expressed a desire to hear it. He responded, "No, you don't." It could have stopped there. But Stollman heard Ayler and put his support behind him, thus providing the first serious platform for what would be called free jazz. He released what was Henry Grimes' only solo album for decades. Giuseppi Logan. Marion Brown. Sunny Murray. Oh wait - I'm getting carried away again. Stollman might not have been the best businessman, but I'm not here to discuss that. I'm here to give thanks to one man's crazy idea that inspired countless others in its wake. And to encourage others to do the same. You never know how many people you're going to reach when you put a piece of art out there. No, that's not the point, but it can be a significant side effect. So, thanks, Bernard, wherever you are. Ripozi en paco. Funny how these things work. Sometimes top-notch, adventurous jazz types come to Pittsburgh and a baker's dozen of listeners show up. Then last night, a guitarist who is arguably one of the most innovative in her field (definitely the most unique voice) and a dynamic, prolific bassist - whose regular gigs include a spot in the Vijay Iyer Trio - come to town, totally flying under the p.r. radar, and they pack a loft, essentially selling it out, at least a week in advance. It's a tad ironic that the duo goes by the name Secret Keeper. But I'm here to celebrate, not castigate. The only reason I'm editorializing is because it would have been cool if the folks who attend things like the Sound Exchange weekly events at the Thunderbird Cafe had known about it, so audiences could cross-pollinate. Mary is coming back for a residency in June/July with the band Thumbscrew. Hopefully everyone can come in contact then. We can be a welcoming people, us Pittsburghers. Emerge, Secret Keeper's second album, isn't officially out yet, but the duo has been touring in support of it for the past week, and last night's set was predominantly drawn from that album's tracks. It was fascinating to watch Halvorson play long, extended melody lines that kept flowing. In the coda of "Bridge Loss Sequence, she switched to chords that almost sounded like Freddie Green's riffing in a Count Basie piece - although the context was way different, and this was only a passing moment. But it shows how much contour can be found in their work. Crump often sounding like he was operating on a different rhythmic plain than his partner, but it was easy to see that they were moving together even if they were playing parallel melodies (or to extend that metaphor, maybe it was more perpendicular). He bowed some deep harmonics and some rich double (and possibly triple) stops. Then the climax to a piece like "Disproportionate Endings" both of them pulled out some outer space harmonics. "Mirrors," originally an improvisation on their Super 8 album, had Crump playing his bass's frame percussively before Halvorson looped a bunch of guitar effects that sounded like sped-up piano noodlings. The audience seemed to stay with the duo through the whole set, sitting in quiet, rapt attention (from what little I could pick up in the second row) and showing their enthusiasm with applause. Here's hoping we'll all see each other again soon at another show. Delmark continues their reissue series of albums on the Sackville label with a 1974 session that could have just as easily been called Two Sides of Anthony Braxton, due to the contrast between what appeared on Side One and Side Two. The side-length "Composition 36" finds him with his Creative Construction Company partner (Wadada) Leo Smith (trumpet, pocket trumpet, flugelhorn, percussion, small instruments) and Richard Teitelbaum (Moog synthesizer, percussion). Conversely, Side Two consists of Braxton and bassist Dave Holland tearing through standards like "The Song Is You" and "Embraceable You," never forsaking the chord changes but also maintaining their own musical identities. "Composition 36" also blends elements of abstract, sometimes pointillistic playing with recurring melodic elements. It begins with Teitelbaum oozing out some metallic drones from his keyboard before a muted Smith and Braxton (playing only B-flat, and later bass, clarinet) state a long-toned theme that will reappear a few more times. The 18-minute piece never really falls into a full group improvisation nor do the players take typical solo spots. Overlap and support are key. Smith wrings life out from upper register squeals, the clarinet squeaks and grumbles through different registers. Teitelbaum creates noisy soundscapes but he also turns them into pedal notes that sound like a melodic vacuum cleaner, and he also unleashes some fast keyboard runs in a more conventional voice. After hearing this on vinyl, one has the chance to ruminate on the contours of "Composition 36" while flipping the record over. With the reissue, we're propelled right into an upbeat, nearly 12-minute version of "The Song Is You" without much more than a chance to exhale. Holland's steady walking bassline keeps the structure in place, still leaving him time to solo. Braxton's alto has a delightfully gruff tone to it that treats the standards well. "You Go To My Head" is played a little more uptempo than normal, and not quite as legato; "Embraceable You" also sounds a little wilder and not quite as much like a ballad. "I Remember You" - one of two bonus tracks - takes liberties with the melody from the first measure, perhaps in homage to Lennie Tristano and his acolytes. As he continues, Braxton adds a few squonks to the tune, which might explain why this track was left off the original album (though length was also probably a major factor). 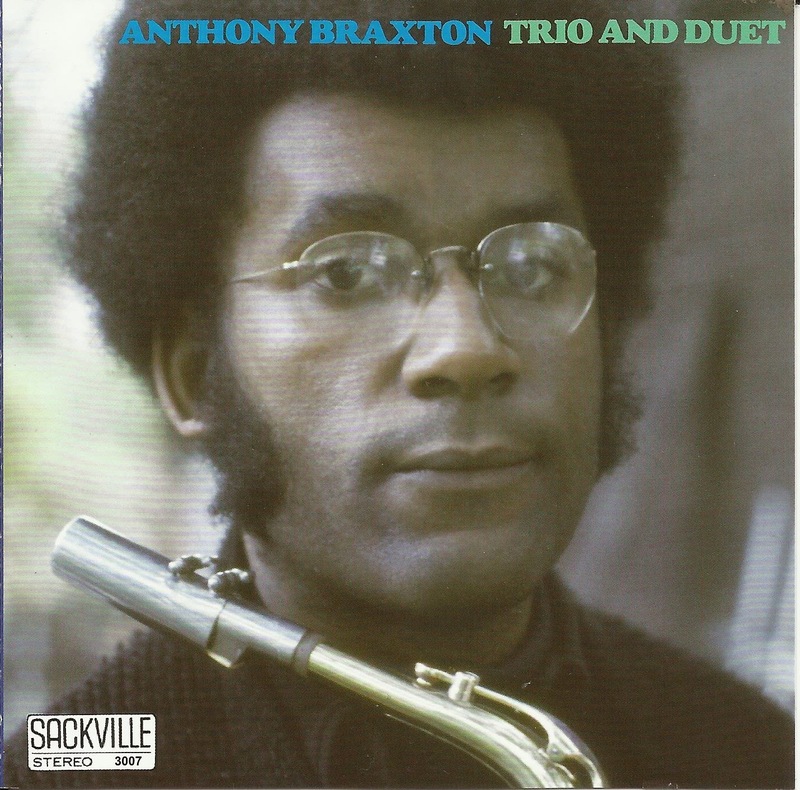 In total, Trio and Duet offers a vast picture of the complexities that fueled Braxton's work.